As the company's eleventh straight record-setting month this year, November's U.S. sales figures were yet another "best-ever" for Audi. Helping fuel the record report was continued demand for the all-new, 2012 Audi A6 which counted 1,379 vehicles sold (a 69.8% increase over the same period last year) and a major jump in TT sales (2,020 vehicles sold, a 115.8% gain over November, 2010's figure). Also worth noting were sales of the 2012 A8, which saw an impressive 38.4% increase. Full report after the jump. HERNDON, Va., Dec 1, 2011 - Audi today reported its 11th straight record-setting month of sales for the year with 9,700 vehicles sold in November 2011, a 3.6% increase over the previous all-time record set a year earlier. Year-to-date sales ended the month up 15.2% with 104,906 vehicles sold, topping the previous annual U.S. sales record of 101,629 set at the end of last year. Sales of the all-new Audi A6, one of the brand’s most technologically-advanced models, surged 69.8% to 1,379 vehicles sold in November 2011. Also up significantly were sales of the Audi A8, the brand’s flagship sedan, with a 38.4% increase over the same period last year. • 2012 Audi A7 sustains momentum with 631 vehicles sold. • Audi TT sales up 115.8% vs. November 2010, bolstered by increased demand for the Audi TT Coupe and TT Roadster, with 1,404 and 616 models sold YTD, respectively. • Audi Q7 sales up 16.0% YTD, compared to 2010. • Sales of Audi Q5 increased 3.5% in November. • Sales mix for Audi TDI clean diesel models finished the month at 54.8% for the A3 TDI, 35.9% for the Q7 TDI. 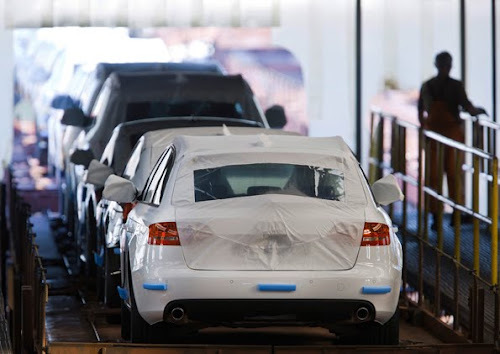 • Audi Certified Pre-Owned sales of 2,688 vehicles mark the best November on record and the ninth-consecutive record month. YTD Audi CPO sales of 33,853 signify an annual sales record for Audi, eclipsing the previous record of 32,108 vehicles sold in 2008. 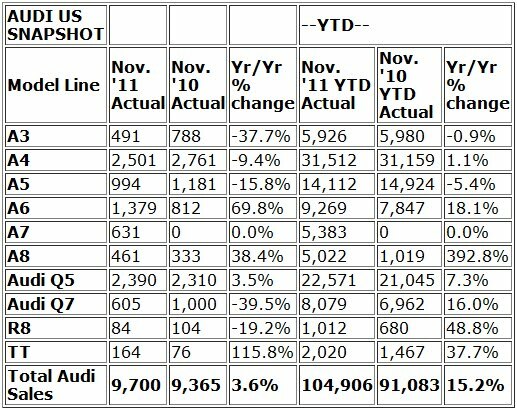 • For the record-setting month of November 2011, three Audi models recorded YTD sales increases of over 25.0%, including the Audi A8, the Audi R8 and the Audi TT model range.